1 of 3 Heat oven to 400 degrees . In a small bowl, combine fresh bread crumbs, chopped thyme, garlic powder, smoked paprika and 1/4 tsp kosher salt. 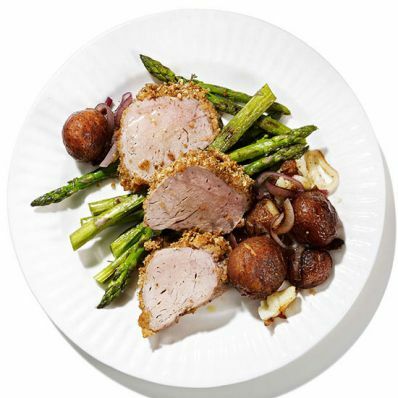 Brush pork tenderloin with Dijon mustard. Pat bread crumb mixture evenly on tenderloin. Place tenderloin on a baking sheet. 2 of 3 In a bowl, toss small red new potatoes and shallot with olive oil, 1/4 tsp kosher salt and black pepper. Place on a separate baking sheet. In a bowl, toss trimmed asparagus with olive oil and a pinch of salt. 3 of 3 Roast pork and potatoes at 400 degrees for 25 minutes or until pork registers 145 degrees . After 15 minutes of roasting, move potatoes to one side of baking sheet. Add asparagus and continue roasting until potatoes are fork-tender. Let pork rest 5 minutes. Slice and serve with potatoes and asparagus.